Music lovers new and old (more commonly known as Warriors and Weirdo’s) have received her with open arms. Recently Aurora performed at the UMG Pre-Grammy show :: Photo HERE and was also spotted with her friend / fan Katy Perry, performed at Disney and very recently met Stevie Wonder to name just a few, so she’s already hanging with the stars and rightly so. Her debut single (when signed) “Under Stars” was released on 12th December 2014. Fast forwarding to 2016 things have taken a fast pace forward for her career from being a local artist to being a worldwide household name. In 2015 her cover of ‘Half The World Away’ originally by Oasis was used for the ‘John Lewis‘ Christmas tv commercial campaign not forgetting to mention her album charted in 6 countries and reached number #1 spot in Norway. Aurora Aksnes (born 15 June 1996) known mononymously as AURORA, is a Norwegian singer-songwriter. Her debut EP Running with the Wolves was released through Decca Records in May 2015, receiving widespread approval from online music blogs and national press. We apologize for the doors slamming and for the mobile phone interference during the interview but it couldn’t be helped and beyond our control. Over 2 years ago we discovered a song titled ‘Puppet‘ by Aurora since then the rest is history. We totally fell in love with ‘Runaway‘ including the video with her captivating dancing style and self expressions, she’s rather enchanting. During the interview we discovered first hand how down to earth she really is and how much her music means to her personally but also she’s really passionate about how her fans interpret her art both physically and visually. There’s just something about Aurora that we can’t quite put our finger on but if like we did; you’ll you just fall deeper and deeper in love with all she does. 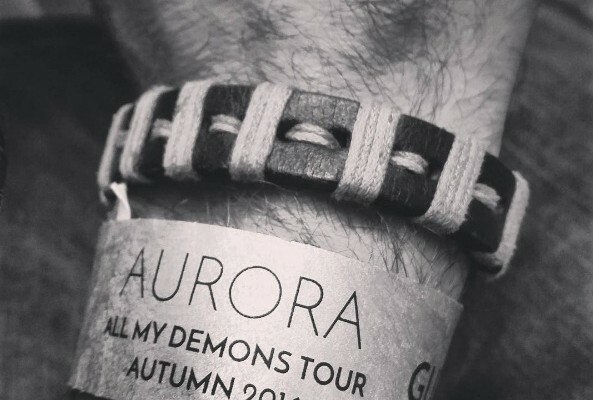 This entry was posted in Interviews, Reviews and tagged all my demons greeting me as a friend, aurora, aurora aksnes, aurora's second album, runaway, warriors. Bookmark the permalink.